Over a low flame, melt butter and add celery, shallots, potatoes, and garlic. Sauté until they are tender. 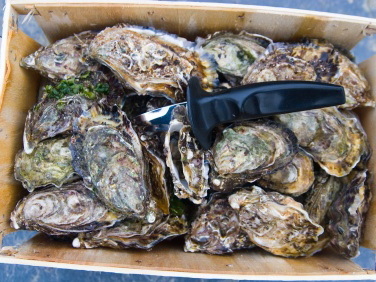 Add oysters, bacon, and parsley, and cook until the oysters begin to firm up. Then stir in the milk and cream. Cook on medium heat, taking care not to let the stew boil or the oysters overcook. Add salt and pepper to taste. Serve hot. This is a traditional thin-style stew. For a thicker stew, add a roux made from equal parts flour and fat mixed over a medium flame for 3 or 4 minutes. Be sure to read Vanessa McGrady's essay on summers spent hunting for oysters on Washington's Olympic Peninsula.